One of the very first things I hung in our house when we moved in three years ago was a set of open shelves in our kitchen. There was this one section of cabinetry and countertops off to the side of the space with the perfect patch of blank wall above that practically screamed for open shelving. Luckily, I had a set from IKEA that I had previously used in my old studio, so it worked out really well. The only problem was that the shelves were on the smaller side and not the same width, so they ended up being a little more decorative than functional. It worked for several years, but this fall I found myself craving more. I wanted to be able to load the shelves with extra plates, bowls, and glasses, not to mention canisters for dog treats, coffee pods, and other kitchen-themed goodies so we could make more room in our overstuffed cabinets. Well, three years later, and we finally managed to cross “install bigger open shelves” off our to-do list. You may have seen the full reveal of our mini kitchen makeover earlier this month, complete with that brand new set of upgraded open shelves, and today I’m back to talk about how I actually installed them. 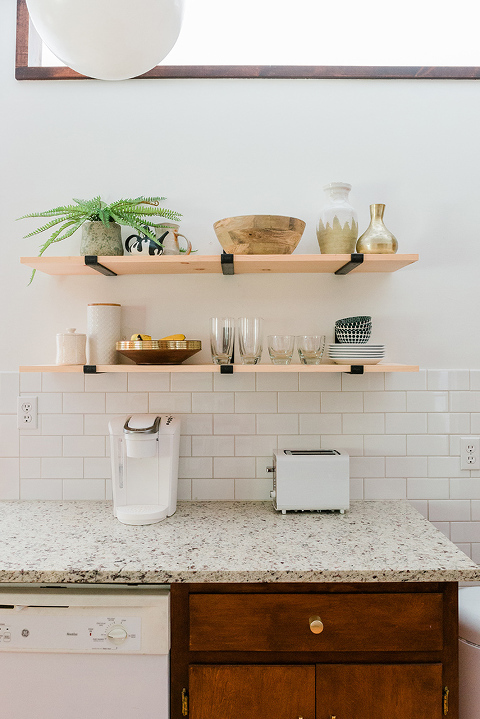 Scroll on for the full step-by-step tutorial, and then feel free to head over to Hunker where I’m offering a numbered guide to styling kitchen shelves, too. 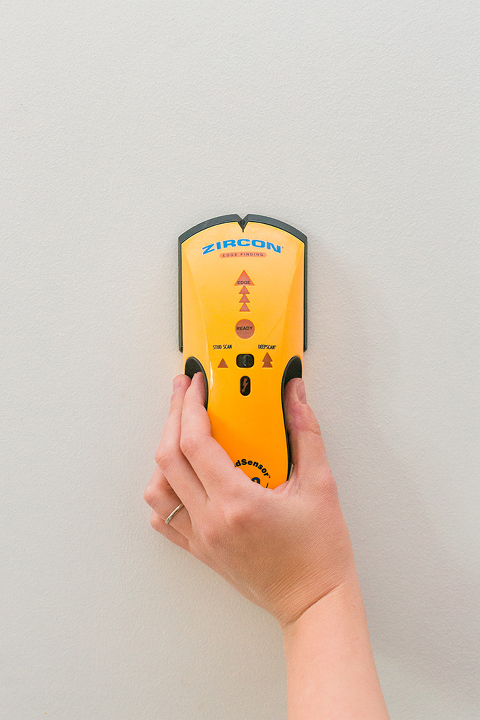 Start by using a stud-finder to locate the studs behind your drywall. If you plan to load your shelves up with heavy dishes and glasses, like we did, you’ll need to attach your brackets right to those wood supports behind the drywall to ensure a strong hold. 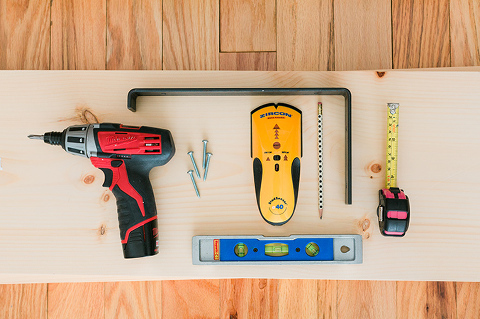 Mark the studs with a pencil, and repeat for however many shelves and brackets you plan to install. For this demo, we installed 2 shelves over 6 brackets—3 brackets apiece. Hold your first bracket up to the wall over the marks you made at the studs, and mark through the screw holes onto the drywall with your pencil. Repeat again for however many shelves and brackets you plan to install, using a level between each bracket before making your marks so you know you’ll have an even shelf when finished. 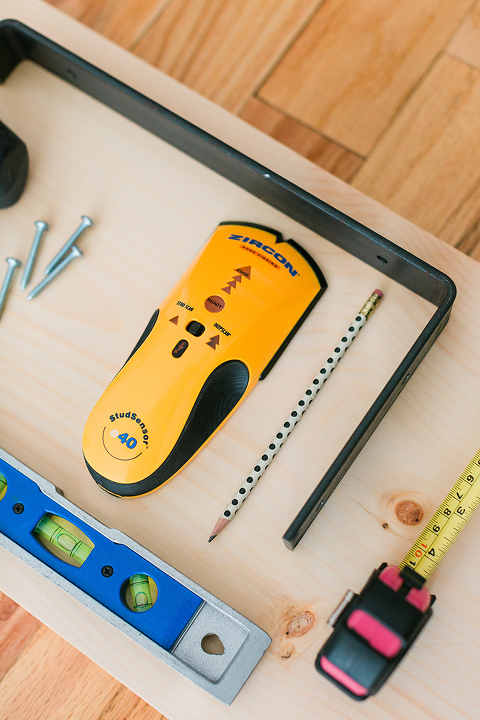 Drill through the marks you made using a power drill and bit that matches your screw width. Then, hold the bracket up over the holes, and use the drill again to screw the hardware into place until the bracket feels nice and snug. Repeat across all brackets. Lay your wood common boards across the brackets so that they’re centered across the brackets. You may choose to screw yours into place, but the weight of your dishes and glasses should keep the wood from shifting in the end. We still haven’t screwed our boards to the brackets, but they haven’t budged. As you may have noticed, we decided to leave our wood raw for now, but will eventually give it a clear coat stain to make it water tight. There’s no big rush on that now, though, since they don’t come into contact with much (if any) direct moisture. These upgraded shelves feel so much more grown-up and functional than the old IKEA set ever did. If you want to learn more about the reasoning behind my styling choices and how I managed to maximize our new storage square footage, click over to Hunker here where I break it all down into seven steps. Let me know what you think in the comments below!